One of my goals in life is to make the perfect chocolate chip cookie. I know, I know, not one of my more ambitious goals by some standards, but yet, an important one to me. I ask you, what cookie is really better than chocolate chip cookie? It truly fulfills all the essential cookie requirements; flavor, texture, chocolate, goes perfectly with milk and it has a low messy factor. 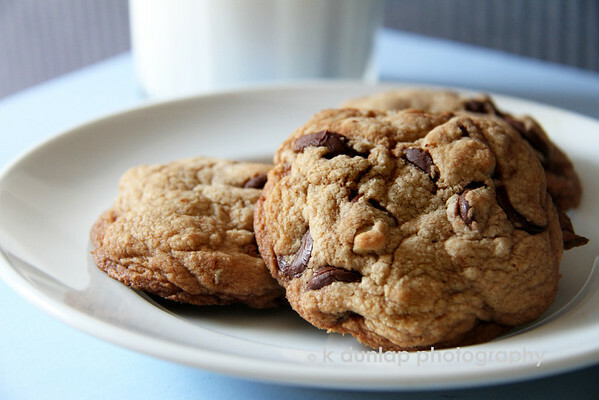 I’ve tried all kinds of recipes over the years, used all sorts of different ingredients and even purchased special pans, all trying to perfect the best chocolate chip cookie. Well…I think I may have done it. I think I’ve developed the perfect recipe for the chocolate chip cookie. I still have a little tweaking to do but, I think I’ve done it! Now if I could only find some volunteer tasters….. Fantastic (cookie!) light and (cookie!) color!!! Awesome (ccokie!) write up...(cookie! )...count me all the way in!!! Love the lighting! This makes me hungry too.